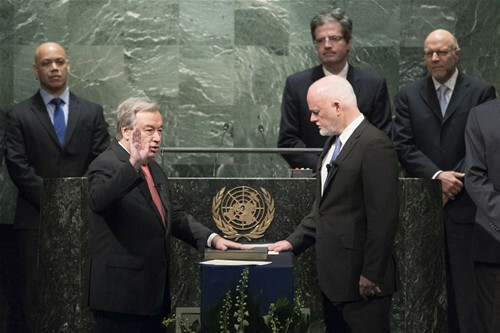 UN Secretary-General-designate António Guterres (L, front) takes the oath of office at the UN headquarters in New York, the United States, Dec. 12, 2016. 2016 has witnessed a great number of thought-provoking events across the world. Many people believe that the international order is undergoing a transition as new problems emerge in the realm of global governance, requiring developed and developing countries to cooperate and negotiate. Also, new trends of cultural exchanges and ideological contests have been established in the context of changing global political and economic patterns. The world is developing, with controversies and competition arising among various parties. The current international order faces two main problems: The first is the rival tendencies to sustain or sabotage the sovereignty of countries. The second is the contest between the new model of international relations characterized by mutually beneficial relationships and the old model plagued by Cold War antagonisms. Centered on the United Nations, the sovereign system is a major achievement political civilization has made since World War II. It serves as the bedrock of today’s international order and sovereign countries. The goals and principles of the UN Charter are not to blame for the present controversies and unfairness. The root lies in poor enforcement. Torrential movements of national liberation during and after World War II gave birth to a global system in which countries recognized the sovereignty of others. However, some countries still support or encourage separatism of other countries and forcefully overthrow legitimate political regimes in overt or secret ways, threatening the established global system. Neo-interventionism, exporting democracy, the abuse of protective responsibilities as well as other external factors have produced domestic chaos and turbulence in a number of countries and regions since the end of the Cold War, particularly since the dawn of the 21st century. The theory of sovereignty requires development to maintain the system of sovereign countries rather than denying the sovereign mechanism because no better method has been found to defend weak countries in the global system. Throughout history, a feasible international order must be based on respect for the sovereignty of members of the global community. Any chaos within the international order starts with damage to the mechanism of sovereignty. To achieve an effective international order, it is vital to build a new pattern of international relations focusing on cooperation and reciprocal benefits. But in reality, some outdated models remain, such as antagonistic military alliances, spheres of influence, proxies and protectorates. We should identify and promote positive factors driving new patterns of global relations while remembering that power politics, militarism, and the Cold War mentality—along with the origins of these phenomena— have not been eradicated. Factors other than military might constitute a country’s comprehensive strength, but many countries still tend to solve problems through military means. Currently, it is urgent to build an effective global governance model to deal with the growing number of issues that all countries face. As the world becomes more and more integrated, delay or amplification of global issues may cause negatively impact the on internal situation of various countries. The global economic system that has existed since the end of World War II is increasingly at odds with the changing economic distance between developed and developing countries. Divergence between collective efforts required by global governance and unilateral, monopolized and exclusive acts is growing. All these issues block reform to the global governance mechanism. Also, discourse power in the process of building the mechanism has become the focus of all parties. A consensus was reached among countries that global issues increasingly need negotiation on the basis of new global institutions, mechanisms and principles. Therefore, the competition for discourse power in building a new mechanism is becoming bitter. A number of emerging fields also experience rivalries in terms of setting rules, such as the firmament, Internet, polar regions and environment. Developed countries have accumulated advantages, while emerging states have taken the initiative to be more involved in setting up rules for these fields. The unity of the world further unleashes productivity. However, economic globalization over recent years has led to an income gap between countries and different groups of people, prompting the resurgence of protectionism. People are searching for a model of economic globalization that meets the development demands of most countries and their people. Throughout history, expansion of capitalism has amplified political and economic imbalance in the world. The central problem of reform is how to benefit more countries with unleashed productivity produced by more global interaction and economic globalization. Many countries currently struggle to balance between development and reform in national governance. The word “reform” has long been attached to developing countries, but it has become an inevitable issue of developed countries. Also, development has turned into their common agenda. In addition, all countries face a number of security threats, such as separatism, terrorism and extremism. In a world filled with interaction, countries should consider international relations when building a pattern of national governance, which is exposed to tests of opening-up, economic globalization and interior environment. History and reality are a testament to the close relationship between well-operating international order and effective national governance patterns. Domestic mechanisms based on antagonism and counterbalancing have produced diplomatic uncertainties due to shifts in political parties and veto powers of legislatures and governments. These uncertainties theoretically hurt global cooperation and increase costs, thus blocking the mechanisms of global governance. In recent years, many international organizations have approved a variety of proposals regarding global governance, but relevant countries did a poor job of enforcement and discounted good proposals. China is active in implementing a reasonable global agenda within its country. For example, it took the lead to carry out the UN Sustainable Development Agenda at home. In addition to dealing with domestic issues, governments need to improve the ability to tackle global agenda because domestic and global problems increasingly overlap. The ability helps a country to contribute high-quality public products and services to the international society. China has proposed many plans and principles that require implementation through bilateral and multilateral cooperation. Global and regional issues cover a wide range of fields. Countries need to improve their ability to handle domestic problems while making smarter moves in dealing with global affairs. Cross-border exchanges of people, capital, resources and talent have led to the vibrant communication of culture, development paths, mechanisms and thoughts. Antagonistic ideas in international cultural fields are expressed, giving people a growing awareness of common destiny in the increasingly connected world while highlighting the impacts and harms of expanded exclusionism and extremism. More countries are independent in choosing development paths and social mechanisms, while at the same time, they learn from each other through communication, greatly promoting and enriching political civilization. However, some countries believe their social and political mechanism is the only right one, thus forcefully export it to their counterparts. Starting from the 21st century, a major transformation of global ideology is the decline of Western liberal democracy. Possibilities and opportunities take shape in the comparisons and competitions of development paths, mechanism and plans. Compared with capitalism, socialism with Chinese characteristics has demonstrated economic and political advantages. Throughout world history, advanced culture, knowledge and programs have driven each critical turning point. The ability to understand the diverse and changing world and apply this knowledge to international relations is a country’s foundation for contributing reliable proposals and talent to the world. A more connected world does not mean the absence of contradictions. Development of the world parallels the constant settlement of contradictions. Currently, international relations are at an important turning point. In the future, it may either submit to the old pattern or develop through transformation, creation and fusion. Countries and regions that can stand out in the great struggles can give the final answer and become the leaders of the future international order. Su Changhe is a professor from the School of International Relations and Public Affairs of Fudan University.